‘FINCH’ is one of two designs I have created using Baa Ram Ewe’s Titus yarn and is one of my first designs not using Rowan yarn! 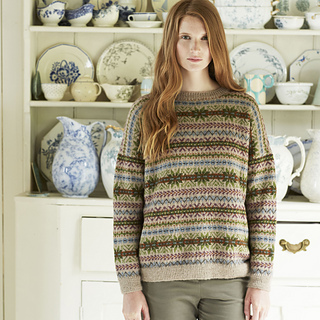 It has been such a pleasure designing with this lovely 4ply yarn as it is beautifully soft and a dream to knit with. 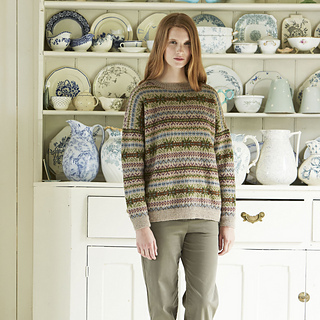 This design is knitting flat and in pieces so you will need to knit fairisle on the wrong side. It is an oversized shape and therefore very comfortable to wear, styled simply with a pair of jeans or other trousers. My model Georgia loved this sweater so much that she asked to keep the photography garment as part of her modelling fee! 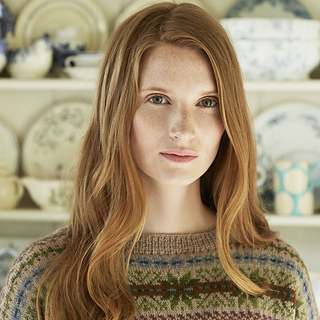 Please note that this design is knitted flat in pieces and therefore you will need to knit fairisle on the wrong side as well as the right side. I hope you enjoy knitting and wearing this design. The yardage quoted is based on size SMALL.